The number 15 is the spiritual ascension seal, according to the German physician and legal scholar Cornelius Agrippa (1486 - 1535). 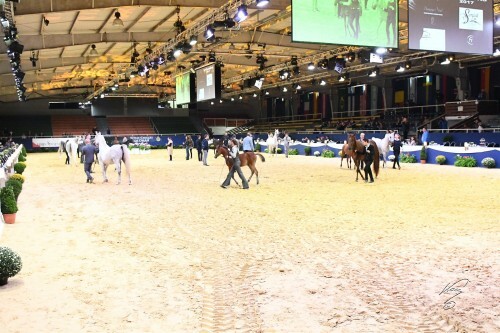 The Arabian Futurity Europe has founded with a good spirit as an initiative for European breeders 15 years ago and turned out to be a winning model. The goal of the founders James Swaenepoel, Karl-Heinz Stöckle and Gregor Aymar was to give a new impulse to Arabian horse breeding and events in Europe and they succeed! The 2017 AFE Breeding Auction celebrated the best result ever and the 2017 Arabian Futurity Cup Finals, hosted by the All Nations Cup Festival in Aachen, saw a lot of happy faces. A team of six internationally renowned and experienced breeders or stud managers assessed the participants: Olivia Strauch, Rebecca Wenden, Hendrik Mens, Gerard Paty, and Dawn Martin. In addition, the public had the possibility to vote via the Internet. Belgian bred fillies took the first four spots in the finals. Knocke Arabians bred and owned the Gold Champion Filly Foal, the lovely QR Marc daughter Pearl Eden K.A. out of Prisma. Silver went to the just four weeks old Sheika, bred and owned by Hans Serroels. Sheika is by SMA Magic One and out of Violetta. Mieke Sans bred and owned the QR Marc daughter FM Marcy out of FM Pippaa winning Bronze. El Palacio is the sire of the 4th place: TZ Louizah out of Khimara, bred and owned by Zacatos Arabians. Another SMA Magic One daughter, EOS Adorable out of Amalia Serondella, achieved the 5th place; she is bred and owned by EOS Arabians, Germany. Sheikja Al Juman took away the Gold Champion Yearling, a grey RFI Farid daughter out of PF Panama, bred by B.M. Arabians, Italy, and owned by Jasim Al Mesbah and Mohammad Alawadhi, Kuwait. Silver winning Ghaalyia came all the way from England. This SMA Magic one daughter out of Gezaana is bred and owned by Julie Kennedy. 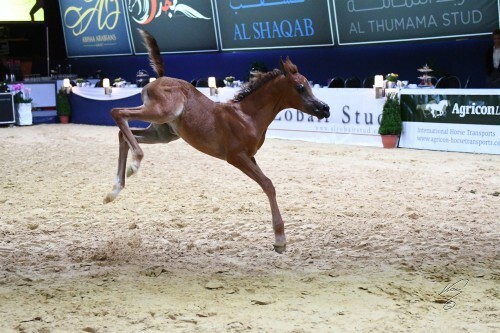 Bronze went to the colt Aaser Athbah by Fadi Al Shaqab out of Star of Marwan, bred and owned by Athbah Stud, KSA. Emerald J, who became ANC Silver Champion Senior Stallion the very same weekend, is the sire of Eralda out of Enezja, who took the 4th place. Eralda is bred by Falborek Arabians, Poland, and owned by Al Shiraa Stables, UAE. DA Ariyana, a chestnut full sister to fabulous grey multi champion DA Alihandra, took the 5th place. This filly is by EKS Alihandro out of DA Miss Justice, bred and owned by Cornelia Kolnberger. Some may chalk all of that up to coincidence, but some may say that the number can only mean something fantastic will happen in their life.